Have you thought what to give your Daddy this Father's Day? Whenever its something special to celebrate for your parents or loved one, the first we think about is how to make the day special. 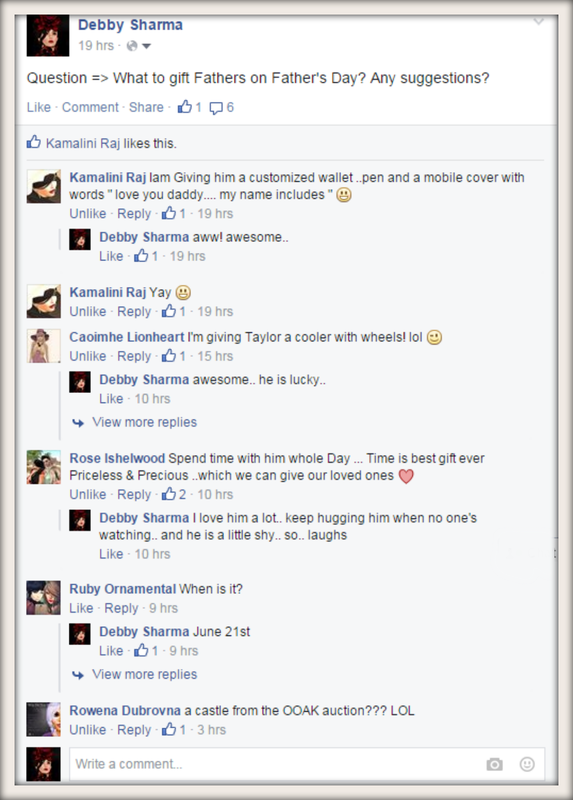 After all, this is no ordinary day, its Father's Day. The role that our father's play in our lives is huge, guiding us, taking care of us. If we think, we can give something back in return as much as they have contributed for us and sacrificed for us. Nothing seems to fit the chart for returning the love. However, Daddy knows you love him. He knows you want to do everything to make him feel special. When I asked the question on Facebook, this is what responses I got. While some thought spending quality time with your father would be great gift, others suggested to give something useful like a wallet or a pen holder. 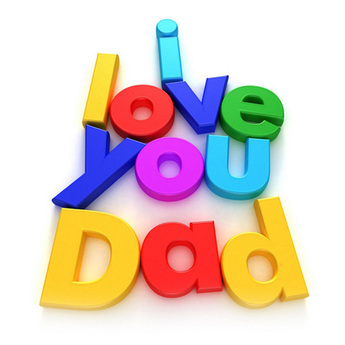 Few also suggested to think about the hobbies and gift your father on those lines. Here are a few Second Life gifts that I would suggest as they are unique and timeless. 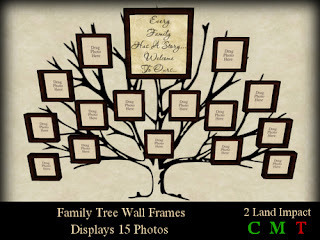 A tree photo frame is a timeless gift for any member of the family. 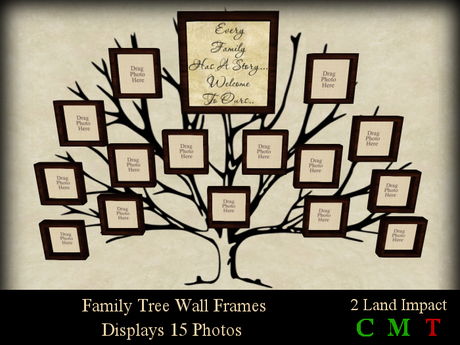 This mesh frame has land impact 2, which means a wall is covered with your sweet memories and no need to worry of the prim count. Also L$ 69 is a great deal to grab. It can hold 15 pictures and is 4m high and 5.53m wide. To capture the sweet memories you would need poses. You may choose to get the poses from "Forget Me Not". The poses by Forget Me Not are mostly under L$ 100. There is also an interesting hud that I found on marketplace, the Follow and Grab Hud. Like in real life, you can run to your Daddy and grab him wishing him a Happy Father's Day. It can be a good gesture to start of the special day. The Hud only animates your avatar, which means you dont need to ask for permission from the other person. This can be a good way to surprise. It is worth only L$99. You may also choose to gift a photo album worth L$ 75 only. A good way to place all your memories in. There is no limit to the number of pictures the album can hold. It has 6 prim count. 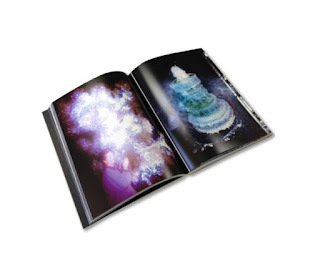 Thanks to Thinc Books, sharing an album with a loved one has become a viable mode. Or if you would like to gift your father some outfit, here is a good choice among others. This T-shirt is made by Freaky Geeky Store worth L$ 195. There are other such outfits for Dad's also available at the store. Among all the gifts, this one is my favorite. This one would remind him of his family in an unique way. 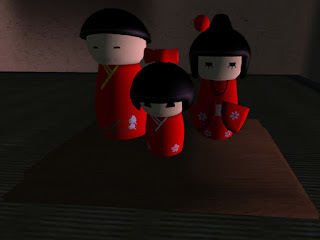 Only for L$19, the Kokeshi Doll Family can brighten any office desk or a home. A cute little gift would sure to brighten his day. Last, dont forget to add in a Greeting Card wishing your Dad, a Happy Father's Day along with any other gift you might choose. A great store is Emma's Shop of Cards and Gifts. All items are below L$10 which goes well with your budget and pocket money. Most importantly be sure to enjoy and be with your father on June 21st. Mark your calendar, gift him something he likes or remembers you. Go to the amusement parks, restaurants, zoo or any where you think it will be fun to be with him. Some may choose to stay at home and cut a cake may be. Have fun little boys and girls and be sure to write your views on how you spent the day with your Daddy in the comments section below.